This is the right time for turn off boring Blogger comment box from your blog, Google has launched Google+ comments to blogger blogs. Everyone likes to add Google+ comments to their blog, If you have interest see our previous post to know step by step guide to add Google+ Comments to your blog. 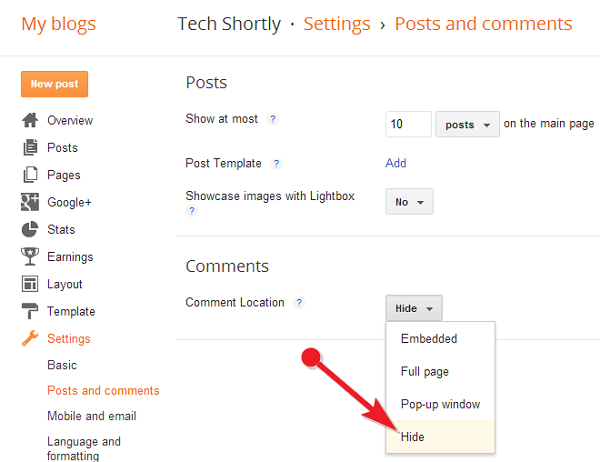 Even you have enabled Google+ comments to your blog, the old comment box will showing on every posts until you turn off it. Then select Hide in drop down menu, finally click on Save Setting button available in top right corner. That's all you have successfully disabled blogger comment box from your blog. It wont show anymore until you re-enable it again.